The Huawei MediaPad 7 Youth has stumbled onto the scene, bleary eyed from the night before and missing a shoe, as the Chinese firm looks to flog the 7-inch tablet market for everything it's got. 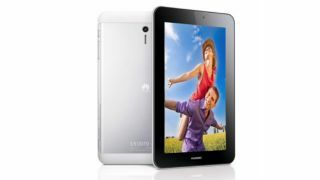 We've already seen the MediaPad 7, MediaPad 7 Vogue and MediaPad 7 Lite launched by Huawei, but it's clearly not content with its output and this time it has the "connected generation" in its sights - in other words, the teen and young adult sectors. In terms of what the MediaPad 7 Youth has to offer you'll find a 7-inch display, 1.6GHz dual-core processor, Android 4.1 Jelly Bean and a 4100mAh battery. It will come in a couple of guises, with the choice between Wi-Fi only and Wi-Fi + 3G on the cards which will not only allow you to access internet on the go, but also make phone calls and send text messages - it's all very Asus FonePad. At 350g it's a touch heavier than the FonePad and Nexus 7, but its brushed aluminium unibody is an acceptable trade off for an additional 10g - plus it'll be thinner than both at 9.9mm in depth. When it comes to a MediaPad 7 Youth release date, Huawei has pegged the slate for a Q3 arrival, so sometime between July and September, and it's confirmed it will be landing in Russia, China, Asia Pacific, Middle East and Europe. We are waiting to hear back from Hauwei on whether the MediaPad 7 Youth will make its way to UK and Australian shores, and the price is also unknown at this point but considering the market we expect it to be pretty cheap.